Elinor Ostrom (August 7, 1933 – June 12, 2012), the only woman to win the Nobel Prize in Economics. In opening by pointing to Nobel Prize-winner Elinor Ostrom’s suggestion that all policies can be viewed as experiments with a probability of failure, Hildén struck at the heart of the matter: what are sustainability experiments? Are they formal, structured, planned attempts to learn from implementation of new approaches or policies? Berkhout et. al. (2010) employ criteria along these lines in defining sustainability experiments as “planned initiatives that embody a highly novel socio-technical configuration likely to lead to substantial (environmental) sustainability gains.” Castán Broto and Bulkeley (2013) use a similarly narrow definition of experiments: “an intervention is experimental when it is purposive and strategic but explicitly seeks to capture new forms of learning or experience.” These definitions imply a level of intention and clarity with regard to expected outcomes must be present to qualify as an experiment. But Hildén reminded us that the informal and sometimes haphazard experiments coming from the grassroots level are also valuable sources of learning. This point was later echoed by Pradip Swarnakar in his presentation, “Sustainability Experimentation Venture Network (SEVeN): Nurturing local knowledge for global change” (embedded at the end of this post). Limiting our definition of sustainability experiments to planned initiatives, Swarnakar explained, excludes potentially important contributions from happening informally and spontaneously. The definition also potentially leads researchers to favor successful experiments that achieve the specified sustainability gains when selecting experiments for case study research. These extremes–formal experiments in the lab research tradition and informal experiments playing out at the grassroots as individuals and communities strive to deal with sustainability challenges–represent the two cultures of experimentation to which Hildén alluded in his opening remarks. The former tend to be biased towards advanced technological solutions while the latter tend to produce rough, unstructured and qualitative “data,” the benefits of which many institutions simply do not know how to realize. What is the relationship between them and can they be bridged? This was the driving question of the seminar. 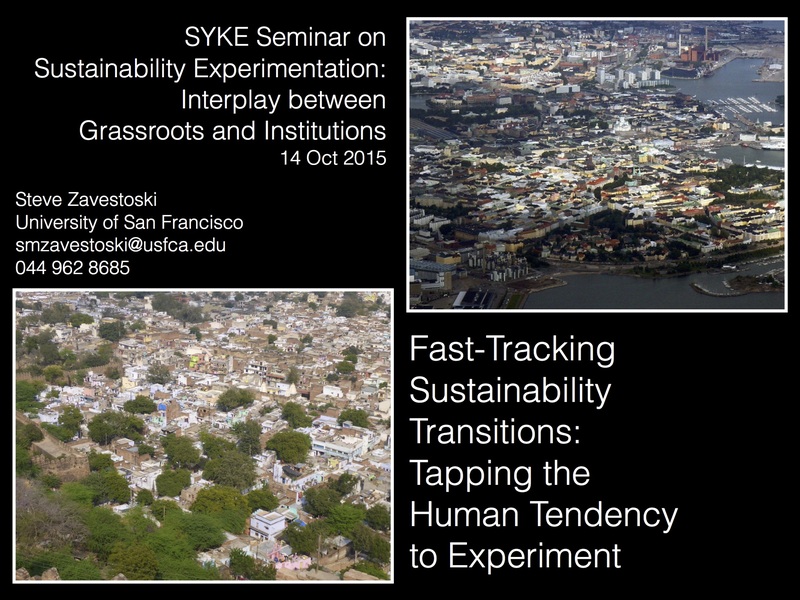 My presentation, “Fast Tracking Sustainability Transitions: Tapping the Human Tendency to Experiment,” which I discussed in the previous post, followed Hildén’s opening remarks. I attempted to make the case that we must learn how to adapt through experimentation and disseminate successful innovations at a rate and scale unprecedented in human history, and that this would require learning from a wide range and diversity of successful and unsuccessful experiments. I introduced the concept of the Sustainability Experimentation Venture Network (SEVeN) as a tool for aggregating knowledge produced through sustainability experimentation; organizing and structuring this knowledge/data; facilitating the synthesis and analysis of the data; and making it accessible for ease of dissemination. Pradip Swarnakar then elaborated on the mechanics of a network built around production, aggregation and dissemination of knowledge resulting from sustainability experiments, beginning with his critique of a too narrow definition of sustainability experiments that excludes many unplanned grassroots efforts. Narrowing in on an acceptable definition of sustainability experiments might require determining the lowest useful scale of such experiments (e.g., individual, household, neighborhood, community). Likewise, determining the kinds of variables that would be most useful in advancing innovations towards a sustainability transition could help refine a definition of sustainability experiments. Would we want to know if the experiment fits into a particular sector (e.g., energy, water, transportation, food)? How about the cost of implementing an experiment or the duration of implementation? The level of technical knowledge required for implementation and the amount of social capital needed would also be useful variables. As with a definition based on the formality of the experiment, the downside of circumscribing sustainability experiments along the lines of the variables and attributes we would like to be able to evaluate is that many grassroots efforts, where collection of such information is not a priority, would be excluded. Rather than move towards a formal definition of sustainability experiments, Swarnakar concluded with examples of what might be considered sustainability experiments drawn from existing case study research (e.g., agricultural innovations practiced by smallholder farmers in Bangladesh); formal NGO reports (e.g., food security strategies of women in rural Nepal); and informal activity reports by grassroots organizations (e.g., dry land farming techniques among peasant farmers in India). Following Swarnakar’s presentation discussion focused on the question of how to get institutions, which are often highly bureaucratic and resistant to change, to learn from the knowledge being produced through grassroots experiments. This juncture in the seminar served as an inflection point as the following two presentations, which will be discussed in the next installment, focused on the efforts of policymakers and governments to engage in experiments of their own. While we weren’t any closer to a definition of sustainability experiments, the seminar was at least producing valuable inquiries into the vital question of how to bridge the institutional approach to experiments with the grassroots approach. I see the grassroots as a huge source of ideas and “pilot” experimentation. I see our role as researchers to identify these successful ideas and deploy/test them in a rigorous fashion. For example I am working on a research project on waste in Mexico where informal recyclers are far more successful than the institutional system. We hope to discover strategies that work among them that could be tested to see if they are candidates for a big-scale up. I look forward to following along with the ideas on Sustainability experimentation.